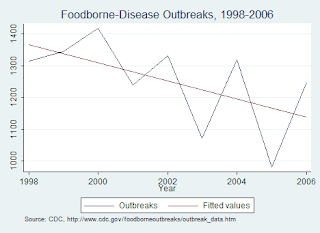 Paul Krugman kvetches, “Without question, America’s food safety system has degenerated over the past six years.” Alex Tabarrok smacks him down with actual data, showing the trend in food-borne disease outbreaks is clearly downward. What wacky theory of regulation says we must have new food safety regulations every year? It’s not as though the old ones expire. Even if you believe that government regulation of food safety is justified and important, that doesn’t mean the total regulatory burden has to increase every year. I suppose that changing times might require changing regulations. Maybe. But unless there are substantial changes in our eating habits or food production techniques, we should then expect modest and incremental regulatory changes over time. Yet Krugman says there have been no significant new food safety regs – thereby indicating that the FDA has, in fact, created new safety regulations in the last seven years, but that’s not good enough for him. Krugman also indicates that Congress has approved significant new food safety regulations. So to summarize: (1) it’s not enough for the FDA to maintain existing food safety regs; (2) it’s not enough for the FDA to create modest additional regs on top of existing legislation; and (3) it’s not enough for the FDA to create modest additional regs on top of significant new legislation. Nope – for the FDA to meet Krugman’s exacting standards, it must always be creating new and significant food safety regulations every year, on top of both existing regulations and new mandates passed by Congress. And that is Krugman’s beef with the FDA. Krugman's metric that told him there's a problem is that he has seen many news stories about the issue. But something that happens constantly isn't news. So when you see lots of news stories about food safety problems or school shootings or whatever, one hypothesis to consider is that this problem is disappearing and in its downward trend has finally dropped below the frequency threshhold that defines what constitutes a rare and newsworthy event. I think you literally take your life in your hands when you go out to eat at a restaurant. The food workers cough and sneeze right into the food, fail to wash their hands after using the toilet, etc. Also, they'll sweep the dirt and dust from the floor while you're eating and spray Windex to clean a nearby window or table right on to food you're eating or will eat, thereby putting cleanser mist right into the food. I believe that every restaurant kitchen should be monitored by closed circuit television. Food workers must obtain a renewable certificate in proper, sanitary food handling. The free-for-all with your and my health must end right now. HOW DARE THEY open the doors to the public and sneeze their snot into my lunch. It's not funny, and I want it to stop right now. Sorry, but there is an important place for Big Brother in the food industry. You can only get sick and die from food poisoning once. The system is so literally putrid that the ones that die become the relevant statistic to create your graphs. Sad that people have to get sick and die and find their way on to a graphic before people realize there's a problem. Can't the ones who resist the regulators and regulations be the ones who eat a turkey sandwich with snot on it? I'll be happy to create the graph showing the relationship between snot and deli sandwiches to make my point. I'm glad my fellow commentor places so much stock in government. You really think big brother can prevent someone from spitting in your food? What good are the cameras if you're already dead from food poisoning?